I hope you enjoyed the series on structure. It was a concise overview, but hopefully it added some value for you. Please let me know what you think. Maya Kaathryn Bohnhoff’s series of posts on “Becoming a Professional Amateur” writing (beginning the first week of May and continuing for seven weeks). Writer Interview: Lori Z. Scott. Series of posts about “adding value” with your writing. Writer Interview (still pending): Dr. Joseph Bentz. Writer Interview (still pending): Dr. David Esselstrom. That’s just what's planned so far. What are you dealing with? What would you like to discuss with other writers? Let me know and I’ll address that topic so that we can facilitate some learning around it. And, if you’re a writer who has something important to say, send an e-mail to palidod@yahoo.com so we can talk about how you can post a series on Constructing Stories. Thanks for reading! If you like what you see and you’re intrigued by what’s coming up, please take a minute to sign up for the RSS feed. There’s a lot happening over the summer, and I don’t think you’ll want to miss it! Act I set up the story. Act II fleshed out the critical elements. Act III should be easy, right? Characters: How have they changed? What have they experienced that has helped them change? What critical actions need to take place in Act III that prove that the character has changed? Even if you’re not using a framework, these are still pertinent questions that must be answered for the reader to feel fulfilled. Now you’ve got a starting point. That’s what you need to answer, but there’s also the how. Act III is your opportunity to showcase your character’s growth. Often times, characters are reacting to situations that arise throughout the story. The antagonist(s) is acting and the protagonist is reacting. In Act III the tables change. It's the protagonist’s duty to act. Why is this so important? Well, for one, the protagonist’s actions should prove that she has changed. Two, it ends the story with a climactic event. This is where the protagonist resolves the problem! Up until now she has been fighting to get to this very place. To sum up Act III: this is where you resolve all the reader’s questions, showcase how the main character has grown (through her actions), and resolve all the story’s loose ends. When you put it that way it sounds so easy, right? You made it through the first act. You focused on the main character, you setup the story, and you engaged the reader. Excellent. Act II is the most difficult act to write. It’s twice as long as Act I, which means it’s twice as hard to keep it on track. It is divided right down the middle by the midpoint of the story, so that helps, but it’s still easy to lose focus. Syd Field’s paradigm uses the midpoint to divide Act II into separate parts. That allows the writer to re-focus her efforts in story segments. Each segment of Act II should propel the story forward. And therein lies the key to writing a successful second act: concentrated conflict and growth. In Act II, the writer must move the story forward. Do you know where your story begins? Do you know where it ends? What’s the critical path for getting from point A to po int B? That’s Act II. Think of it as a road trip. You start in Los Angeles, end in Orlando. You’ve got a beginning (the setup), and an end (the result of trip and how it changed your characters). The journey between the two cities is Act II. The analogy works for two reasons. One, Act II must keep moving. You’re not going to get to Orlando (or the end of your story) unless the car is going somewhere. Two, the story isn’t going to be interesting without conflict and growth. Something has to be happening that moves the story forward. Characters struggle, learn, overcome, and eventually change. Here’s where Act II becomes painful. What were the most critical stops on your road trip? What events on the journey made the most impact? 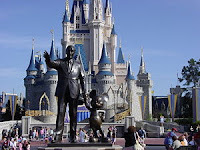 When you reached Orlando and looked back, what really contributed to your learning and growth? Anything that may have been cool, but didn’t amount to much by the time you reached Orlando has to go. Act II is about concentrated conflict and growth. The story becomes the focus. It’s intentional, and demanding. Last post, I mentioned that when the writer works within a framework or structure, he or she has the ability to knowingly or intentionally break the rules. If, as a writer, you don’t have a set of rules or guidelines to play with, then you won’t know when you’re breaking the rules. How, then, do you figure it out? Take Act I and focus in on what needs to be accomplished before we hit Plot Point I and dive into Act II. What are your goals for Act I? What do you want the reader to experience? When Act I is over, what is it you want the reader to think, feel, and understand? Goal #1 - The Main Character: the reader understands and begins to associate with the main character (including the key obstacles that he or she needs to overcome). Goal #2 – The Foundation: the story’s premise and plot are developed. Goal #3 – Engagement: The reader is fully engaged in the story and can’t put it down. These goals give us focus and hold us accountable. We now know what we want to accomplish in Act I. We can measure it. Take your goals and infuse them into your structure. Can you break some of the structural rules and still accomplish your goals? Try it. See if it works. Measure it. Goals are important. They define how we will interact with the fictional world around us. The next time you sit down in front of the keyboard or notepad, write out your goals and intentions for Act I. Try it! Did I miss any critical goals for Act I? Do you have a different set of goals when you begin to put words on a page? Let me know! Act I is one of the more enjoyable acts to write. Why? Because we start writing! We explore, test out our characters, and determine the setting and tone for the rest of the story. Act I is critical. If we want our audience to keep reading (or watching), we must engage them! Pg. 1-8: Present the main character and showcase her problem. Pg. 9-16: Focus on main character and demonstrate how this problem is affecting her life. Pg. 17-24: Identify exactly what the problem is (culminating with Plot Point I). Dial into your main character. The character must grow throughout the story. Determine where the character is and how she’s currently interacting with the world around her in Act I. Build tension. Set the tone. Allow the reader (or viewer) to become entrenched in the fictional world around them. I break the rules in Act I. Screenwriting requires extreme brevity. The focus must be on the main character throughout Act I. Writing a novel, however, allows for increased complexity. While I still focus most of my attention on the main character, I also add elements (usually from other major characters) that will appear later in the book. And that’s why paradigms are so effective. You can intentionally break the rules and get away with it. What’s your initial reaction to Act I? What do you do differently? What do you do that similar? Referenced in this post: The Screenwriter's Workbook by Syd Field.